Have you seen the wonderful sneak peeks that had been appearing on the Heartfelt Creations Blog and Facebook page? The wait is finally over, the beautiful Window Scene Collection from Heartfelt Creations is now available! The Window Scene Collection will start shipping on Dec. 3, and all orders will be processed in the order they are received. 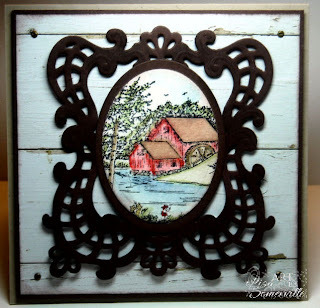 Die Cut the Fancy Window Frame in Chocolate, sponge Chocolate ink on embossed areas to accent. Stamp image from Scenic Combo Precut Set in Black Archival on Watercolor paper, color using H20 Brush and Markers. 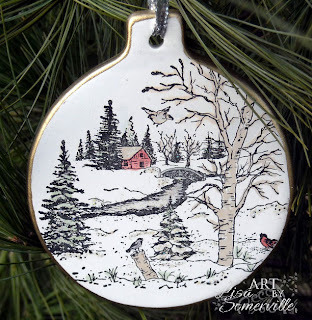 These new images look wonderful on ornaments too! Stamp image from the Snowy Window Scene in Black Stazon on Ornament Blank, let dry. Color as desired. Add Stickles, let dry. Use Krylon Pen around the edge. If desired, seal with Fixative Spray. Looking for more inspiration using the new Window Scene Collection - pop over to the Heartfelt Creations Blog. Heartfelt Creations will be offering an amazing Black Friday Savings of $20 on this must-have collection and a FREE PreCut Stamp Set of your choice (valued at $14.99) with every order over $50.To qualify for the free stamp set, you will need to list the free stamp set of your choice in the "comments box" when checking out. If you do not list the free stamp set, you will be disqualified for this offer, offer expires Nov. 26 at 12 Midnight EST. Lisa, these 2 pieces are so beautiful, and so dramatic! I really like the look of the ornament. It is lovely. The framed piece is so over the top fabulous! I love that frame. It needs a look like you can give it to carry it off, and not let the frame become the focal point! Thanks for sharing these fabulous 2 pieces. Both of these are just fabulous. Love the images on the ornament and the card. Wonderful! Beautiful GF, amazing art, amazing stamps...luv the ornament. Awe! Soooo pretty...thanks for sharing love your color combinations and looks very victorian, love love love them!